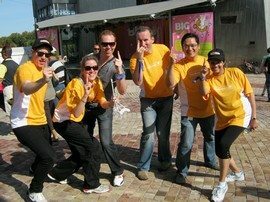 Your Whole Team Will Enjoy This Brilliant Corporate Team Building Activity in Marvellous Melbourne CBD. 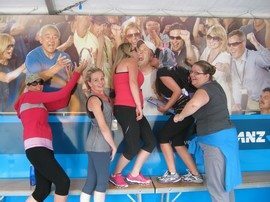 Are you looking for a half day team event which suits all team members, is a great laugh from beginning to end and is guaranteed to strengthen the bonds of friendship in your group? 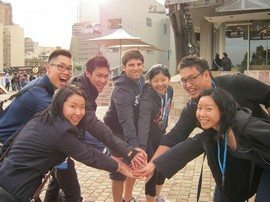 This scavenger hunt style event works for all teams, from 8 to 80 people. It will get your group outdoors is just competitive enough to make the result interesting. 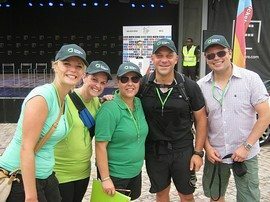 We “run” the Amazing Race in the very heart of Melbourne with the Yarra as the star; it includes the beautiful calm surrounds of the Botanic Gardens, to the river, then the bustle of Southgate, the intriguing Melbourne laneways including a special challenge in Hosier Lane. The final checkpoint is Federation Square, creating a unique backdrop for our Photo Shoot challenge. We always start in the Botanic Gardens (opposite the NGV) and can finish anywhere in a 5-8 minute walking radius of Federation Square. And the best bit? Finding the perfect spot to relax and compare experiences with a drink at the end! 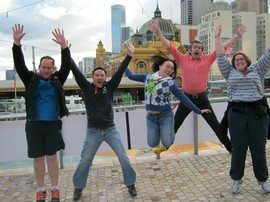 At Team Bonding we think the Melbourne City Centre course is the best route we offer Australia wide.